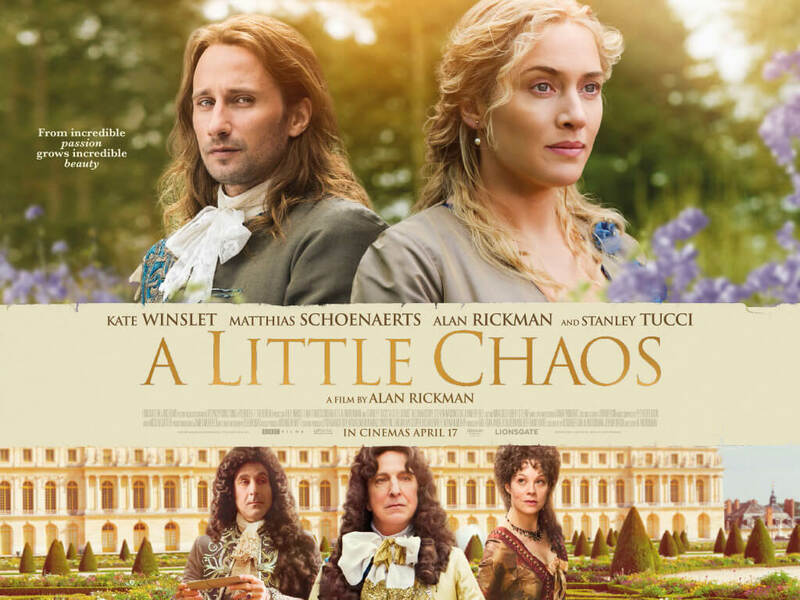 The title A Little Chaos is correct – there’s very little that happens in the movie which could be considered to be chaotic, and even then it’s nothing outrageous or even revolutionary. Hell, the most that Kate Winslet’s fictional gardener Sabine De Barra does that’s considered out of line in the entire movie is place a pot plant outside of its line in a circle on her way to an interview with Matthias Schoenaerts’ real-life landscape architect André Le Nôtre. Aside from that, this is a very standard period piece that’s as non-chaotic as you can get. Alan Rickman, directing his second feature after his 1997 play adaptation The Winter’s Guest, clearly aims for something that’s both an interesting and stylised costume drama, and by most accounts it’s a noble effort; Rickman does have a good directorial eye, recognising the need to show a character’s emotion through visual means rather than just explaining it straight to our faces (anything that hints at Winslet’s tragic past is very well done, coming to a head in a climactic scene that is powerfully paced and constructed). However, what he mostly ends up building is something more camp than perhaps was intended, with the flamboyance of the period shining through in the numerous wigs and velvet costumes its characters wear, and the very basic good and evil characteristics resembling those in a pantomime rather than anything else. At the same time, though, there is a tight restraint on everything which lends itself little opportunity to stand out even at its most flamboyant. It is probably a film tailored to be enjoyed by King Louis XIV (Rickman), here played by Rickman in a supporting role that ironically threatens to overshadow everything else. It would be for good reason, too; anything that happens within the royal court, whether it be involving the King – who is front and centre in the most farcical scene, where he is mistaken by De Barra for a lowly gardener – or even his far camper brother Phillippe (Stanley Tucci, sorely underutilised in a role that sadly goes nowhere) is far more interesting than what the film tends to focus on, that being the development of a fountain on the grounds of Versailles, and especially the lead romance. Regarding the latter, it is where the film tends to lose its way quite severely. Winslet herself is serviceable, but Schoenaerts – having already proven to be a fine enough actor thanks to turns in Bullhead, Rust and Bone, Suite Française and the upcoming Far From The Madding Crowd – is trapped in an utterly bland performance, perhaps his least impressive to date. With the long hair, striking facial features and composed stance, it’s clear that Rickman sees Le Nôtre as more of a common romantic lead than the accomplished landscape architect that he was, which is a vision that Schoenaerts seems to disagree with and, in retaliation, sleepwalks through the role as emotionless as is possible. It’s more than likely that this is down to Rickman’s direction because, as we’ve made clear, he has done very good work in the past and is likely to do so in the future, but for whatever reason he’s not given the free reign to shine here as he should. Schoenaerts’ lack of emotion hurts the impact of the central romance badly, as it prevents him from developing any chemistry with Winslet which makes their eventual moments of passion even more unremarkable. The fact that De Barra is a strictly fictional character as opposed to someone like Le Nôtre who really existed is also worrying, as it strays from likely historical accuracy to tell a simple love story in 1600s Versailles, which might be harmful to the legacy of the real people involved. Helen McCroy, meanwhile, is left with no choice but to ham it up as Le Nôtre’s villainous and controlling wife, who chastises her husband for his flirting yet hypocritically has her own relations with other men, and then later floods the in-development fountain that De Barra is working on (because, erm, evil). All that’s missing is a thin, twirled moustache on her upper lip, that’s how much of a cartoon villain she is portraying here; and it’s strange too, because there’s not a lot to be found about her real-life counterpart to compare it with, so it’s unclear whether it’s an entirely accurate portrayal or doing the real Madame Françoise Le Nôtre a major disservice. Take it for what it is, but don’t expect much in the ways of chaos in A Little Chaos, except for perhaps an ill-judged romance and confident but unbalanced direction by Rickman. 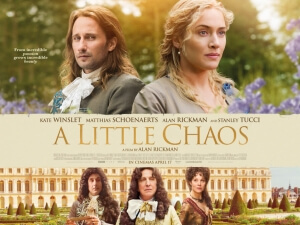 A Little Chaos looks handsome, but although Alan Rickman is a competent director he finds problems with balancing the camp and flamboyant nature of the story, instead focusing on an uninteresting main romance.